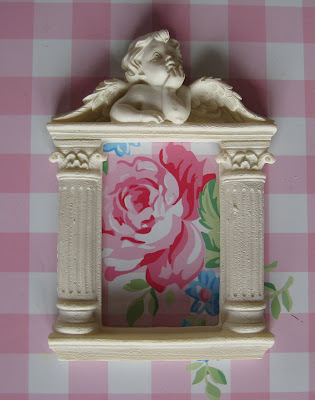 I've been making a few little things for the shabby house. A shabby magazine. 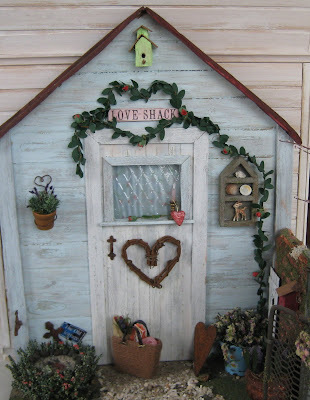 The title of the magazine is 'Flea Market Style' (a perfectly shabby title!) it is a new magazine and is unfortunately not available in my part of the world. 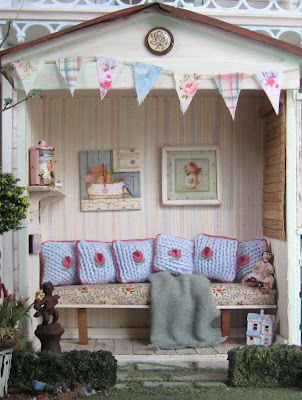 Linda MacDonald is the editor at large of the magazine, her wonderful blog 'Restyled Home' I have followed for a long time, plenty of great (inexpensive) decorating ideas there! 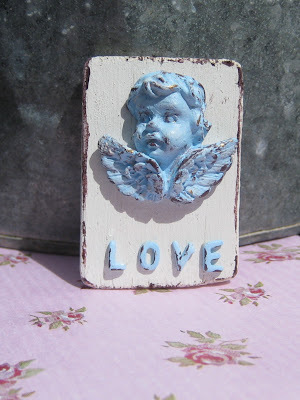 And here is the Flea Market Style blog. 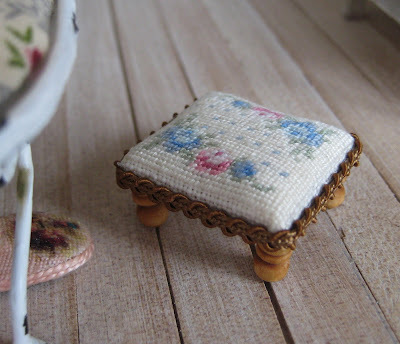 I asked the super-talented Rosanna to embroider me a piece of fabric that I could make into a shabby footstool and she sent me this exquisite piece (quite some time ago I should tell you!). Last night I finally made it into this. 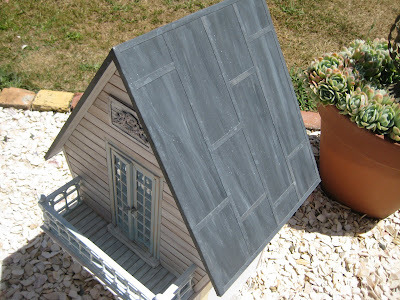 The shabby house is nearing completion. 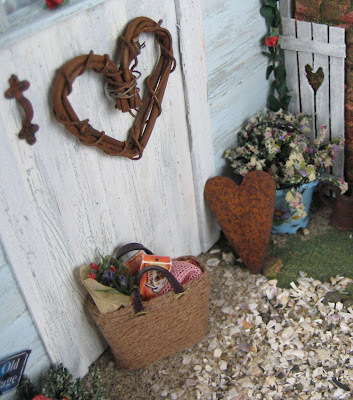 Once I've finished all the little details (ha, ha! will I ever be finished?!) I'll take you on a shabby tour! You can imagine how excited I was to find this pile of packages from Sylvia in the mail! 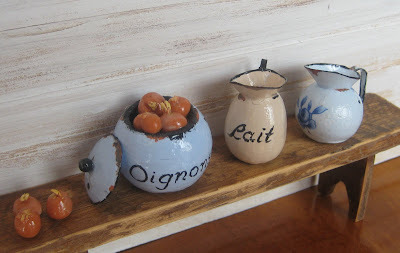 Sylvia sent me some of her fabulous 'brocante' style enamelware, I LOVE these things! And just look at those tiny onions! 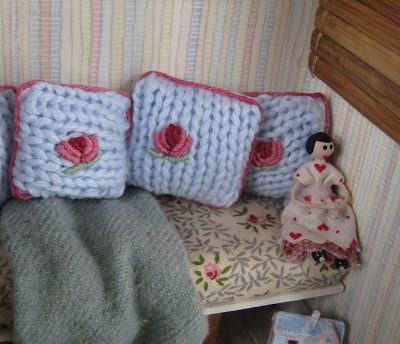 Also in the package was this crocheted bedcover and cushions, just beautiful, I love the colour! 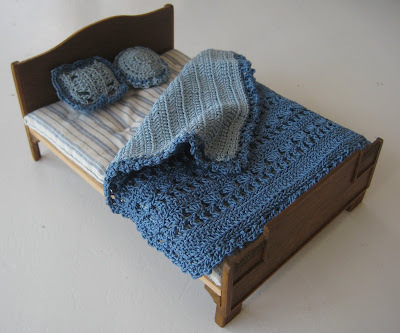 The bed and mattress were made by a lady at our club, alas they have no home yet but I just love the style. And would you believe Sylvia also knits!!!! Is there anything that woman can't do, lol!!! How cute is that little jersey? Mail from The Netherlands and Spain! 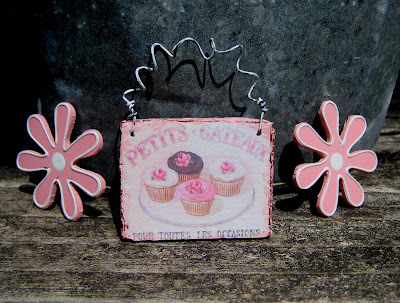 These pretty little things are gifts sent to me by Sylvia last week. 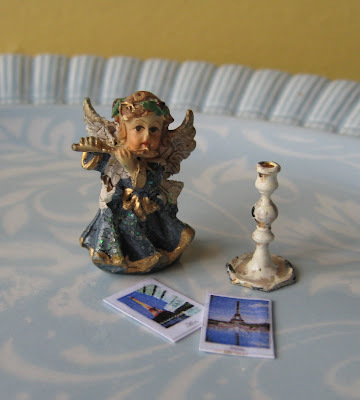 A gorgeous tiny angel ornament, a beautifully painted candlestick and two tiny Paris postcards. Sylvia also sent me this fabulous frame. 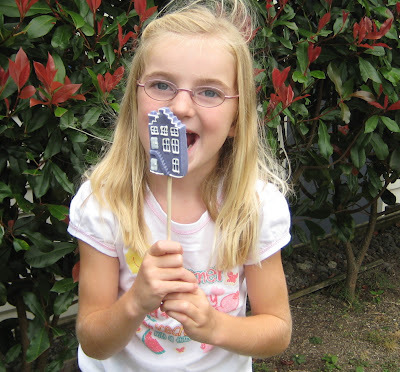 And especially for Liberty there were stickers and the most fantastic house shaped lollipop. Liberty said it was the BEST lollipop she had ever had! 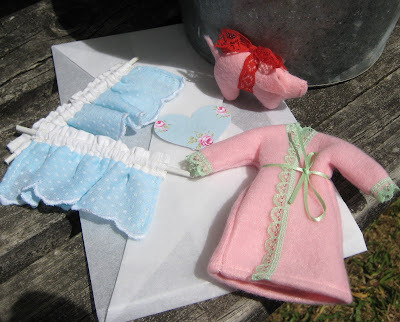 Click here to pop over to Sylvia's blog where she is having a giveaway - it is in two parts and you could win something made just for you by Sylvia! I was very lucky with the mail once again last week! 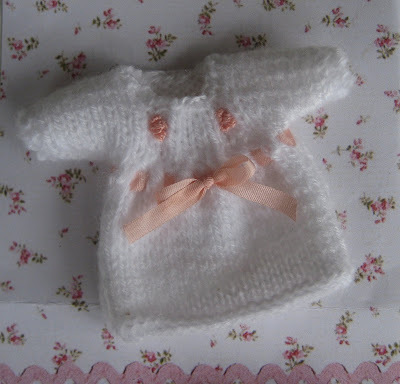 This beautifully knitted little dress came from Meli who lives in Spain. 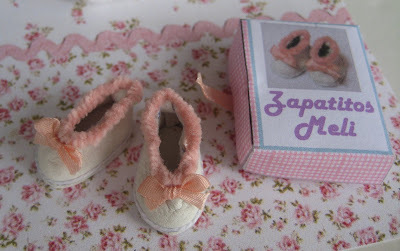 Meli also sent this fantastic pair of little tiny slippers, they are so beautifully made and look so real!! The slippers match the dress perfectly. Meli is such a lovely person, I told her once in an email that I would love to hear someone Spanish say my name and she rang me!! A trip to the Dark Side for Noah's 13th! Today my son Noah turns 13. 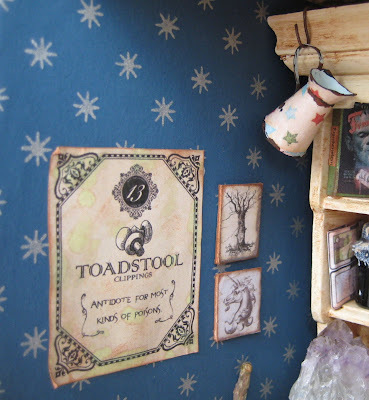 I decided it was time to use the witchy minis that Debbie sent me and make him a little room box. 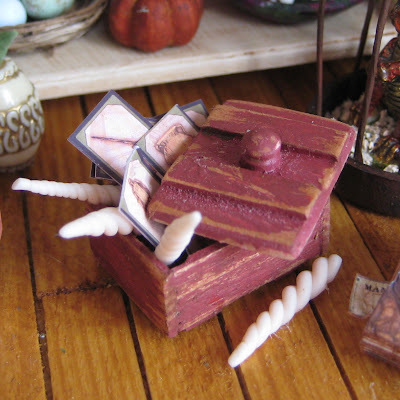 The box is quite small (14 x 17 x 10cm), the same size as I used for the pixies Christmas. 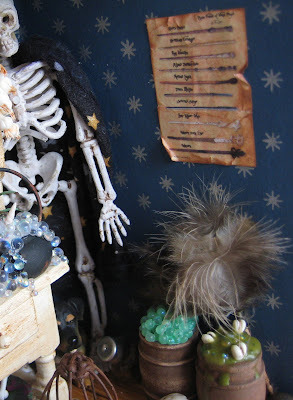 I painted the skeleton sent by Debbie, his cloak is lined with a Noah's Ark print fabric. The Frankenstein book was a gift from Katie. And the garlic was from Susanna. I tried to make a jar of eyeballs. Maybe it would have looked better if I'd used white beads. As usual I was just using what I had. I filled the jar with clear nail polish after I'd added the eyeballs. The orange book there is 'Paris in a Week' - even wizards want to go to Paris! 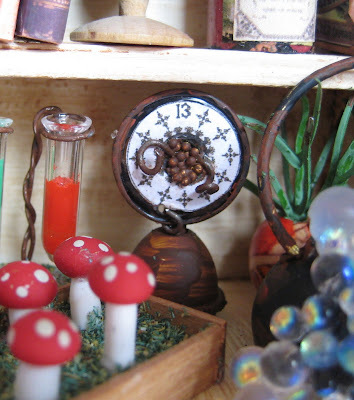 Clock made from bit's'n'pieces. Clock face graphic can be found here. I found the crystal rock in Noah's bedroom. The knife was a gift from Sabiha. 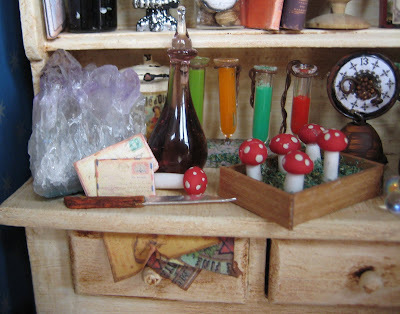 Toadstools, glass bottle and fabulous test tubes were from Debbie. 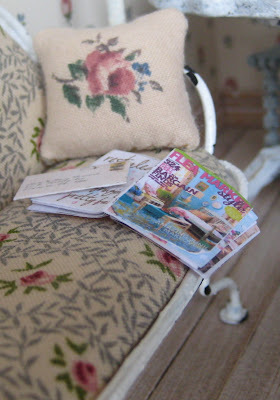 And a room isn't a room without mini mail. 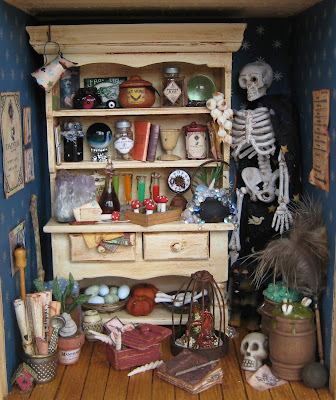 There's also a canister of olive oil in the back there, you never know, a wizard might want to cook something nice for dinner. 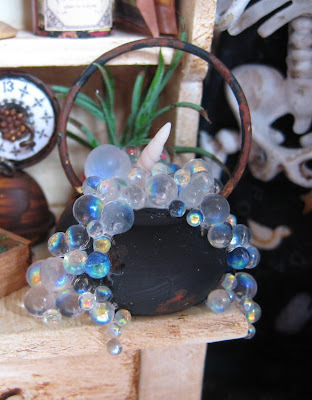 Debbie sent the glass bubbles to make the bubbling cauldron. Liberty thought they were 'very cool'! 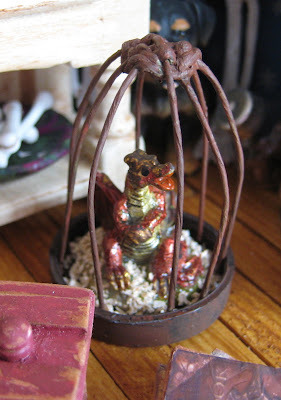 The cauldron was a funny brass teapot that I pulled the spout off and painted. I painted some 'Dinosaur' eggs in a nest from Sabiha who also gave me the pumkins. Bones from Debbie in a bowl made by Katie. I made this box similar to one that Sabiha sent me and filled it with Harry Potter game cards and unicorn horns which came from Debbie. 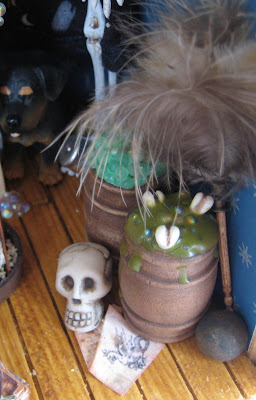 Fabulous barrels and skull from Debbie. Feather duster from Susanna. 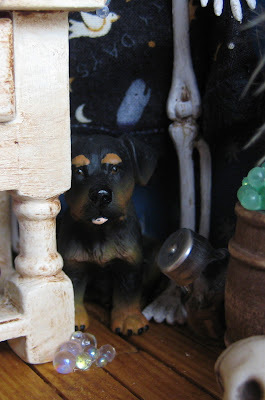 Here's the dog Susanna sent me in the Advent Calendar swap, he has his jar of biscuits nearby. 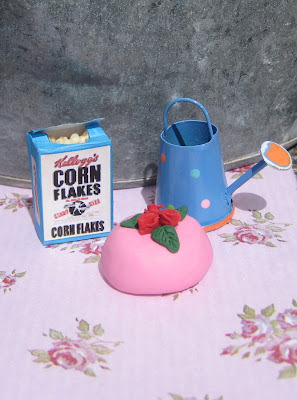 My mum gave me that ladle in there with the rolls of paper goods. 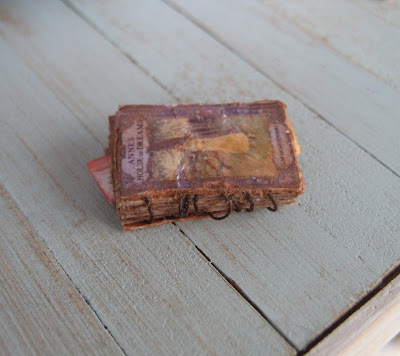 Mum turns up with little things she has just 'found' all the time. 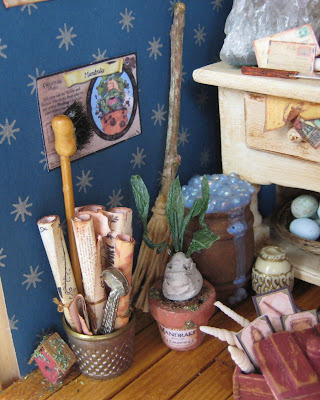 And there's a funny little Mandrake plant that I tried to make late last night from some clay (I can barely see what I'm doing at night these days! ), may have to invest in a properly made one some day. 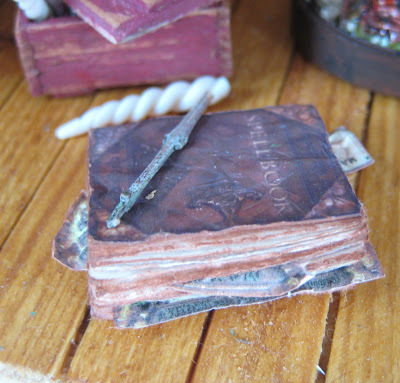 Ancient spell book and wand. 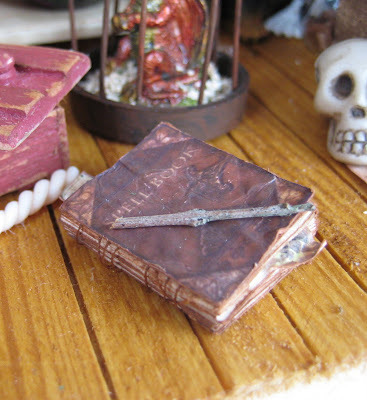 I really enjoyed making the spell book! Every room needs an old pitcher! Harry Potter wand chart on the wall. 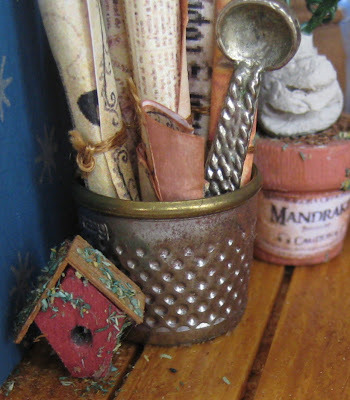 And of course it wouldn't be a room by me if it didn't have a little, tiny birdhouse! I hope you've enjoyed this little trip to the dark side as much as I did. I have to say it was a lot of fun! Thank you to all of you who have given me such wonderful inspiration! 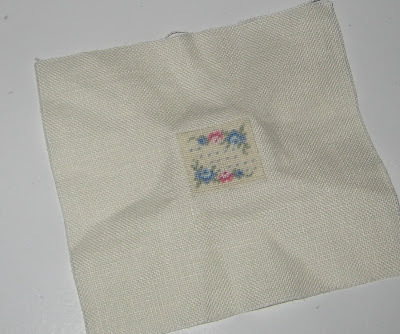 I was looking through Liberty's old baby clothes the other day when I found this little cardigan that I had embroidered rosebuds on when she was just a few days old. 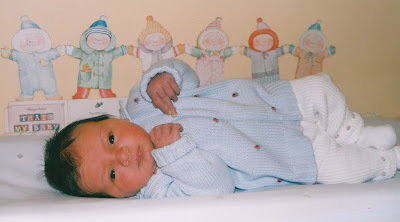 Yes, that's a very dark haired new born Liberty! 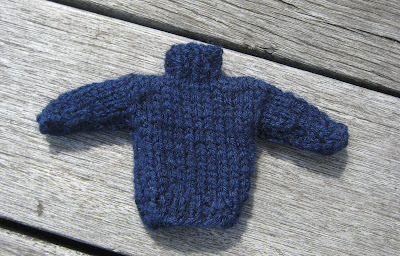 The cardigan was in no state to be worn by any other babies so I cut it up and made miniature cushions. I smile every time I look at them and remember that tiny little baby of mine. 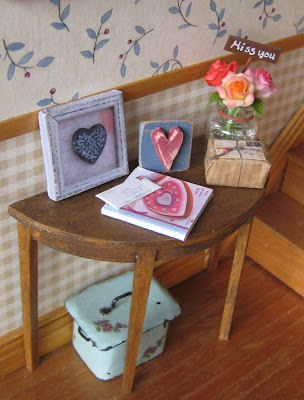 Jo also sent a couple of rusty tin hearts - I love rusty tin things!! My lovely sister-in-law bought me this 'stone' heart magnet when we were shopping at Christmas time. I've glued it onto a piece of scrapbooking paper and framed it and now it sits on my mantelpiece. 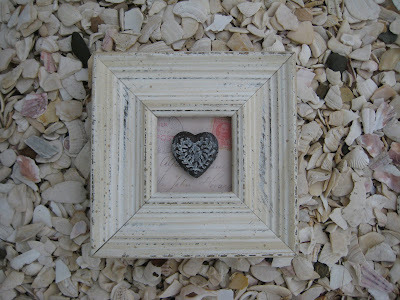 I used the photograph of the stone heart to make the picture in mini! It's just the photo printed on paper and wrapped around a block of wood, 'easy peasy lemon squeezy! -no frame-making needed! 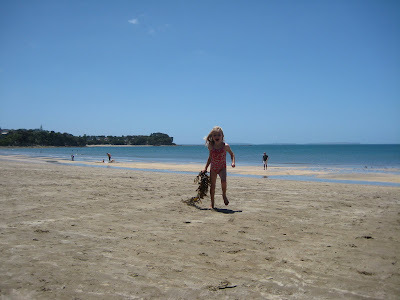 On Wednesday it was so hot we headed to the beach at 6pm with our dinner - sausages, bread and tomato sauce, lol! Sometimes the kids do help each other out! This pic was taken about 7:15pm, still hot and sunny. 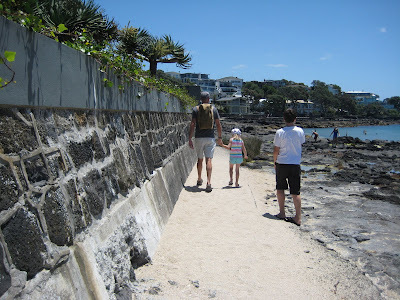 This was in January on our way to another beach around a winding walkway. I love the pic of Liberty walking off with her daddy. Here's the beach the walkway took us to. 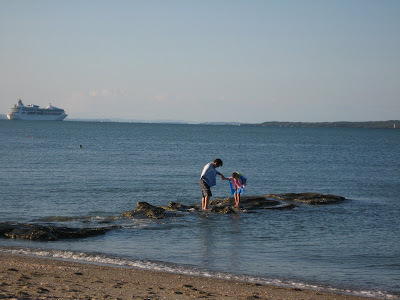 Why do kids love seaweed so much? The mail service has been very good to me this week! 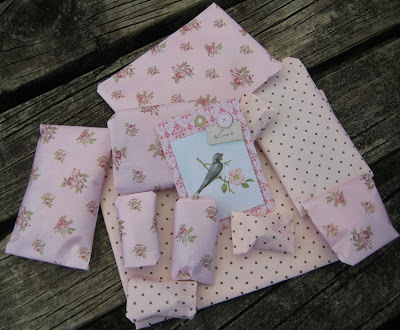 I had the pleasure of receiving a beautiful shabby chic package from Lissu in Finland today. 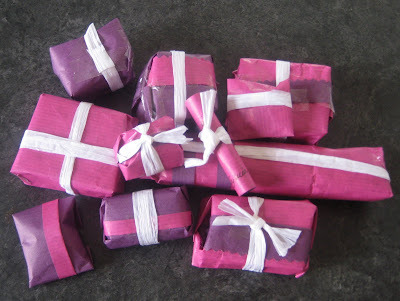 Just look at all those pretty packages! It felt like Christmas again! Too beautiful!! 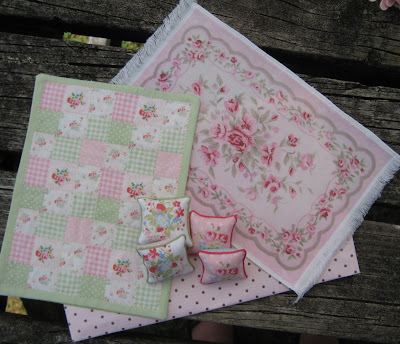 'Greengate' cushions and a quilt - so wonderful to have these in mini because I could never afford them in 'real' life, lol! And how gorgeous is that floor rug! Curtains, a robe and the cutest pink pig! 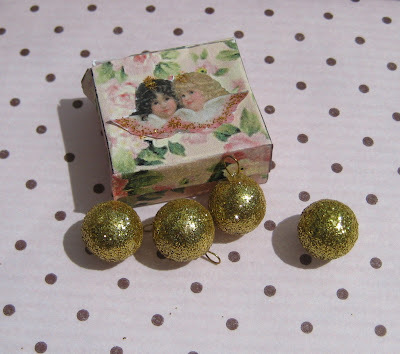 A gorgeous shabby box full of baubles! I have admired Lissu's minis for such a long time, it was such a thrill to be able to swap with her. 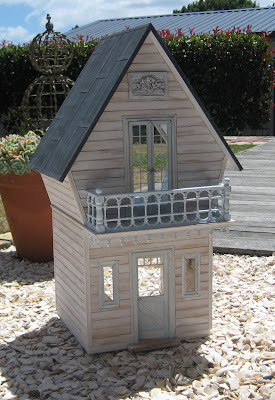 If you haven't popped by Lissu's blogs before you're in for a real treat...she has many fantastic dollhouses and a blog for each one. If you click on her name it will take you to her main blog and you can visit the others from there. 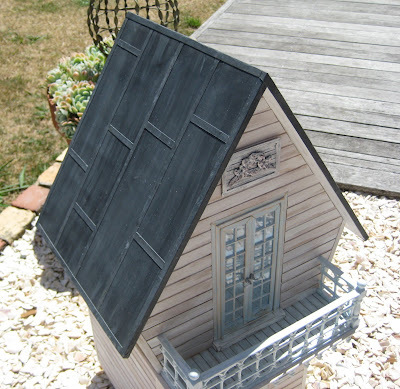 I've known for a very long time how I wanted the shabby house roof to look. And now the kids have finally gone back to school I've had some time to make it. All it took was a piece of cardboard and some paint!